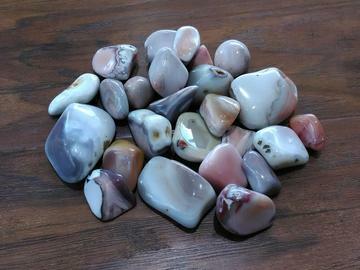 Botswana Agate is a variety of banded Chalcedony, a mineral of the Quartz family. It is predominantly banded in shades of pink and gray. It is mined in africa. Botswana Agate is good for those serious about giving up smoking. It is a receptacle for negative energy and toxicity. It is also used for inner stability, composure, and maturity. Its protective properties encourage security and self-confidence. Stone sizes range from 3/4" - 1 1/2"